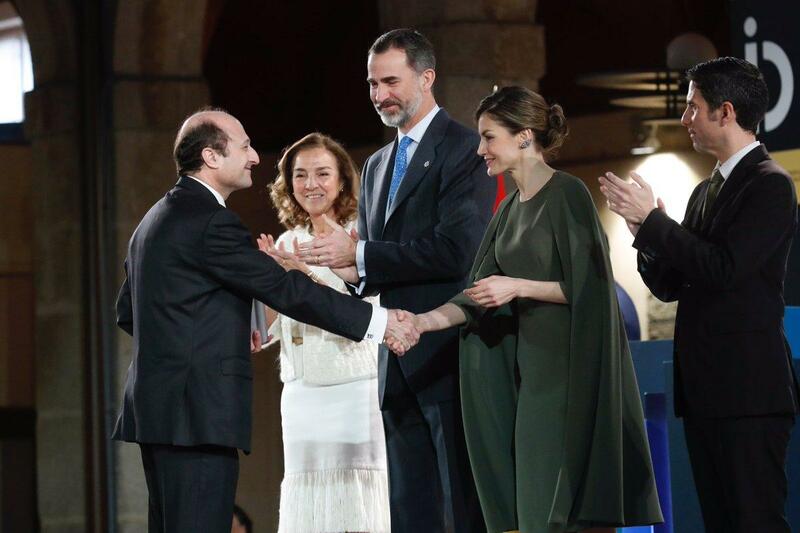 King Felipe and Queen Letizia presented the National Design and Innovation Awards this week. Oooooooooooh! A cape!!!! Give me allllll the letterrrrssss and allll the exclamation points, because Letizia looks fabulous. All the swashbuckling drama of a cape in a not-too-scene-stealing olive color, smartly accessorized with her snakeskin pattern pumps. Tremendously well played. Have we an early entry for her Best of 2017 pick? We have indeed. The King and Queen of Spain also attended the 30th anniversary of the Expansion newspaper last night. And also, oooooooooh! There's actually a lot to digest in this ensemble - braids in the hair and maybe the first Carolina Herrera outfit I'm not 100% sold on - so here's a gallery for your exploration, but right here and right now I will just say: EARRINGS. I don't recall seeing these before, and, well, wow.